The Museum is documenting the stories of Gippslanders who have played a vital role in the defence of our country in times of war and peace. 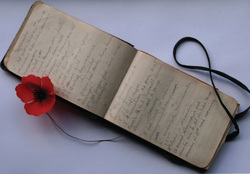 A recent addition to the collection is the war diary of Maurice O'Neill of Longford and Woodside, completed by his brother Simon after Maurice's death. 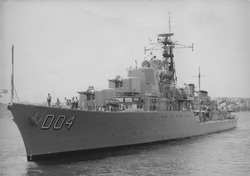 Monday10 February 2014 marked the 50th anniversary of the HMAS Voyager tragedy, Australia's worst naval peacetime disaster. The late John Larkin of Briagolong miraculously survived the fateful accident as a 24 year old sailor. His wife Anna spoke to ABC Gippsland about the tragedy.